Looking To buy sports cards? Who On Earth Is Wally Moon? This is a Topps 1960 Wally Moon baseball card #5. First of all, this card was a pretty random purchase. It was one of those put in a certain amount of money and you get what you get kind of drawing. At first I wasn’t too happy, I mean who even is Wally Moon? But then I saw he had a unibrow and suddenly everything was okay. Plus, the card came in a one touch case. Moon, the 1954 National League Rookie of the Year, was a career .289 hitter. Twice an all star, he spent his entire career in the National League splitting time between the St. Louis Cardinals and the Los Angeles Dodgers. Moon received MVP votes three times, his best finish coming in 1959 during his first year with the Dodgers when he finished fourth in MVP voting. He won a Gold Glove Award the following year for his stupendous outfield play. During his rookie year he led the league in plate appearances with 716, he has to be one of the only rookies to ever do that. In 1959 he led the league in triples with 11. In 1960 he led the league with 21 double plays grounded in to, I guess that isn’t something you should be too proud of. Finally, in 1961 he led the league with a .434 on base percentage. Moon finished his 12-year career with 142 home runs, 1399 hits, and 89 stolen bases. He played all three outfield spots as well as some first base. His career WAR stands at 24.7, and during his best season he recorded a WAR of 5.5. Overall he was a pretty poor defender finishing his career with a -8.9 defensive WAR, but during his Gold Glove season he had a .4 defensive WAR. During his only year on the Hall of Fame Ballot in 1971 he received 2 votes (.6% of ballots). 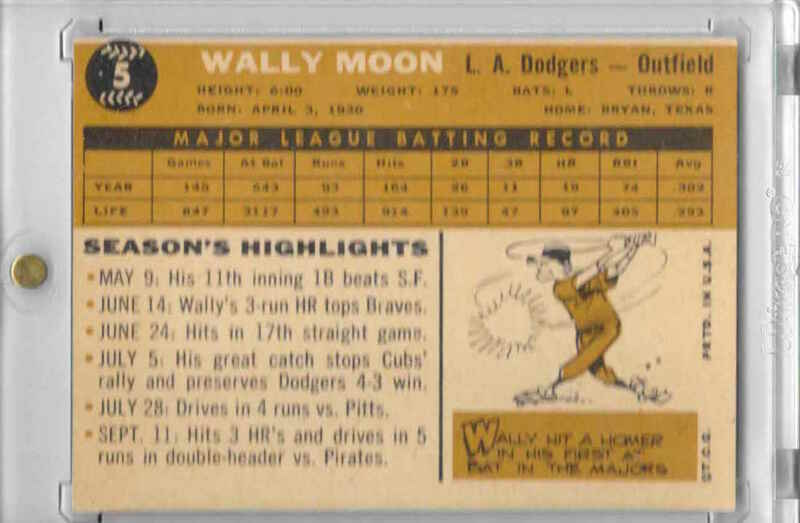 If you read the back of the card, you will notice a caption saying that Wally Moon hit a home run in his first career at bat, there we go now that is something to be proud of. Wally’s real first name was Wallace, named after Wallace Wade the famous football coach. Overall I am now happy with this card. This was probably the first time I’ve really looked this far in to the history of the card. What a wonderful piece of history. I guess we can call Wally the Anthony Davis of Baseball?